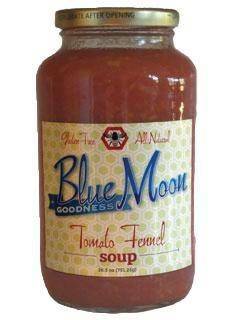 Blue Moon Goodness has introduced a new soup flavor… Tomato Fennel… which has a hint of carrot for extra summery sweetness! Amp this one up by adding roasted shredded chicken or pork sausage. Or consider adding buttermilk and vine-ripened tomatoes, or black beans and fresh sweet corn. There’s always lots of fun ways to build on these soups to suit any taste. Other Blue Moon Goodness soups include Moroccan Vegetable and Vegan Green Chile. Each soup is harmoniously flavored and warmly spiced to be gently nourishing, all while generously fortified with locally grown ingredients. Please note… Blue Moon Goodness is currently making a seasonal pesto; look for it in the freezer section!